Lights flashing and off, people chatting peacefully among themselves, the sounds of small children’s laughter filled the air as they innocently played with a small pup; their parent’s watching over them in an oh so tender way, the innocence. It was so calm, so… typical. It almost gave the impression that the cruel world we live in was perfectly sane, careless. Where having to fear the creatures that creep around in the dark was the least of their worries. This is how the Third District looks like after two weeks of serene and untouched harmony, it was a fun place, where one and all could come for a quick laugh or share a few good moments with old friends. Do some shopping maybe. It was all too perfect. The hotel was bustling with people looking for a reservation: men, women… Everyone seemed to want to fit into such a small hotel. What was the hurry? The small bear-like creatures we’ve all come to known as ‘Moogles’ were flying frantically in and out of shops, good workers indeed, showing others hospitality and agreeing to fulfill their every order. On the other side we could find a shop that brought more interest to the public eye. A small man, made into a huge sign: a green hat that was being held down on his ruffled white hair. Maybe it was falling off? A huge bow was tied to his neck collar and to finish the look: a giant cane held by one of his gloved hands. He had a crazy look on his face, maybe to be considered… mad. This indeed was the Mad Hatter’s Dresses and Suit shop: Him being the sign itself. The shop had a many few customers: business men and women who hadn’t been able to work for weeks were flocking in and out of the store. Some satisfied others… not so much. The night truly was something out of a dream. So festive, it was something to be truly cherished, one in a million. These were the comments citizens of the bustling place known Traverse Town would describe it. This was almost a first to them, a small improvement… maybe. They kept their hopes up and continued on enjoying this night. A small glittering light that shined weakly under the other more… flashier ones was spotted on top of what was known as The Gizmo shop: A double-floored shop whose big clock and bell towered over the rest. It was the center piece of the area, that, and the small fountain that was located near the exit to the First District. Glittering, the small light managed to capture the attention of a few, most of who dismissed as a Moogle playing tricks. But a Moogle it wasn’t, there was a slightly shadowed figure holding the shining object up. And upon closer inspection it was a human. A blonde girl holding the object up, a boyish-type baseball hat made her face remain the in the shadows as the glittering object was brought to closer to her face a pair of satisfied eyes looked it over. Examining every inch on the dazzling sparkle it had. This girl was Karin, and that object was stolen by her earlier in the day. She had managed to steal it from the Accessory shop. Tapping it every now and then her curiosity over the object grew bigger and bigger, it had power. But what kind of power was her question. She sighed, setting the object aside and looking down on the citizens of Traverse Town. You see, she was seated at the edge of the bell tower, it was refreshing. The night was so happy it almost made her smile. The dark corridor disappeared as Sayuri walked through it. She had had enough of being in the castle and she felt she needed to get out. Xemnas would be mad she knew when he found out she had left without his consent. She honestly didn't care what he would do to her when he found out, she could take it. She had decided to go to Traverse Town, though as she stepped into the town on the Bell Tower, she remembered her fight with Sora. She had let her anger get the better of her and she had lost control of herself. She sighed and looked over the town. It seemed completely different from the last time she was there. The town seemed to be teeming with life and there were people everywhere. 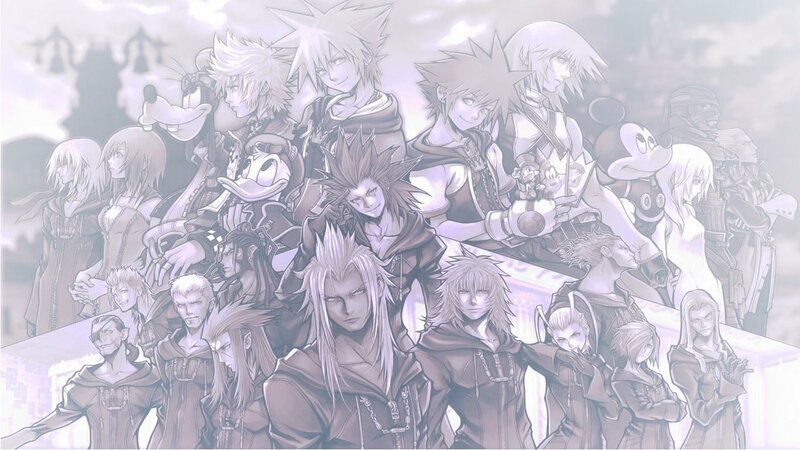 Xemnas had taken out about half the district and it seemed like nothing had even happened. She looked over and saw a girl sitting down. She had some sort of object with her and Sayuri became curious as to what it was. She didn't go near the girl, seeing as Xemnas could come into the town any moment. The small breeze that plagued Karin’s thoughts with horrific intentions was getting stronger, slightly ruffling her hair in the process. She worried about the inhabitants of Traverse Town; this was a rare emotion that rarely surfaced, for a careless girl like Karin, she’d try just to brush it off. Ignoring it to some extent she managed to sit correctly, trying to ignore everyone and their cheerful laughter. This process, for her, was nerve wrecking. Her selfish tendencies were begging to take over the best of her, turning her mind into a more unpleasant one. If only he were awake… Her mind was begging to her, to hear from her best friend, the part of her that kept her sane. Yet, he slumbered so soundly, without any worries, he was almost an embodiment of Karin herself. Yet she was so oblivious to this and tended to call him a fool, an idiot. She was so ignorant when it came to her companion’s actions that to her, he was nothing more than a tool. And she wasn’t even going to appreciate his aid. Nope, not one bit. Karin blinked as if her mind had gone blank; she spread her hands out stretching, as an unseen force was beginning to form behind her. It seems the wind was correct…yet… She yawned, finishing her stretch and cutting off her thoughts. The night was still giving her a bad sensation of worse things to come. Darkness began sprawling from far behind her, taking form into what seemed like a portal of some sort. As her carelessness took over, Karin did not look back. She wanted to know if this new presence was going to be a real danger or not. Footsteps, light footsteps that indicated that someone was coming out of this so-called portal rang in her hears. Every step she heard formulates a different plan of attack. That’s how her brain worked; too bad she never takes the time to use it. Karin remained calm none of her features changed as this unknown presence walked out. It didn’t seem to want to cause any harm… for now. While the footsteps came to a halt, the presence was only a short distance away. And, out of the corner of her shadowed out eye, she managed to look at who was now accompanying her in such a lively night. Karin observed as the person looked over the District such as she had done before. It was a girl, whose appearance was younger than Karin herself for about one… two years maybe? At least in height she did. This girl didn’t seem threatening, she didn’t trust her. “What do you want?” Karin had finally decided to speak up; her tone was sour, letting the new arrival know that her mood wasn’t the best at these moments, even though her expression was far from showing it. Sayuri looked away once the girl place the object in her pocket. She was still deep in her thoughts of her battle with Sora. She regretted coming to Traverse Town that day. There was something that was still bugging her from that day. Sora's appearance... why was it some familiar if she has never met him before? She had the feeling she knew Sora from somewhere, but she knew she couldn't possibly know him. Maybe he has some connection with one of us, possibly Roxas she thought, laughing slightly. She looked at the girl her hood hiding her face when she spoke. Though Sayuri didn't hear anything the girl had just said. She assumed it had something to do with what she was doing there. She didn't pay anymore attention, though, and chose not to answer her. She wouldn't waste her breath talking to her, she didn't want to say anything anyways. Fine… She still didn’t look over, she remained seated were she was. Her legs dangling off the edge of the almost political-looking roof; it wasn’t that she didn’t want to see this person; she just wasn’t in the correct mood for socializing. And from the looks of it, the other was feeling the same. Silence filled the air at the uncommonly active Third District. The Kids had stopped playing, the hotel was dead silent. The businessmen and women remained inside the store at all times. Something had caught the lively people’s attention. Heads turned, others hid. What in the world were they looking at? Karin, leaned in, squinting her eyes the slightest just to see what was going on. The curious inhabitants of Traverse Town were heading to a fountain near the exit to the First District. Karin leaned in further, almost at the tip of falling down, and at the realization of what was going on she pulled back. The fountain, it was changing. Sinister black auras were being emitted out of it. Hesitant chatter was being heard; they all wondered what it was. A man, around his late thirties, walked towards the still changing fountain. The man was lost in a trance; his eyes had lost all sort of life. The crowd of people behind him had thought he was going insane. They knew better than to approach such a thing yet they stayed near it. Was it stupidity? Or just curiosity; Karin pondered. As soon as the man had gotten close enough, the dark aura turned into a hole. Out of it, a pair of wide golden eyes could be seen. They disappeared in a flash, the man just stood there as more shadows began sprawling around him. Enticing, bounding him to it. He looked to the sky; his heart was being filled with dark intentions. And soon enough, they had taken over him. Turning the man into one of these… creatures. Karin finally smiled; she knew exactly what was going on. They were all to die soon, having their hearts stolen. Something Karin had wished, and preferred, from the beginning. Yet her subconscious had told her otherwise. Lowering her head, the young fifteen year-old was fighting over whether or not she should take action. Her lack of care, her discontent… She feared having the same fate as that man. She was selfish and in a way was now beating herself up over it. Sayuri stared at the fountain being surrounded by dark auras. She knew it was the work of a heartless, a powerful one at that. Getting out of the castle had appearently been a good idea, since now she was going to get the chance to destroy the heartless. Her face still covered by the shadows, Sayuri jumped from the tower and landed in front of it. She walked calmly to the fountain, walking through the crowd of people gathered at it. When she finally stood in front of the fountain, she saw a pair of yellow eyes coming from the fountain, trying to seek her dark intentions. It didn't seem to find any and Sayuri just looked at the man who had been transformed. There was nothing she could do for him except destroy the heartless. But to do that she needed it to be out in the open. She summoned her keyblade and held it in a battle position. "Show yourself!" she said, her own voice sounding different to even herself. The crowds of people made a path as the hooded girl went through them, some asking each other about the her mysterious appearance. They had never seen anyone like her before, where did she come from? They gazed on, observing her every move. Not even once did they think about running away. The golden eyes that remained inside the dark cascade watched intently, observing her, waiting to make their move. Whatever this force was knew what it was up against. It sensed her power. This creature stared on as the hooded individual summoned what seemed like a giant key of some sort. A keyblade…? The sudden summoning of this weapon had caught even Karin’s attention, snapping her out of every bad notion that was going through her body. She had heard of such a weapon but never in her life did she get a chance to see one, until now that is. The creature didn’t seem faced by the weapon this Nobody was holding. In fact, it only blinked; it acted as if it were nothing. Quite a cocky little monster, wasn’t it? The area was silent until the girl decided to speak up, telling the creature to show itself. The hooded girl’s voice was firm, strong. It took this as a challenge. Its eyes widened, and slowly began disappearing into the darkness. A massive roaring could be heard from inside the dark hole that was now the fountain. Strong winds began coming out of it, followed by barrage of Neoshadows that began attacking the crowds of people that stood so idly by. Panic and fear began spreading among them. Now not even the ones that had decided to stay secure inside the stores were safe. These Neoshadows were spreading, attacking everything in sight. Karin stood; she was surprised by the large groups of creatures that were now appearing out of that hole. Her eyes never left the panic filled streets. She knew there was more to come. The creature that was heard inside that hole was now ready to emerge, it roared yet again as if giving a sign of its presence. A massive claw-like body extended out of it, this being one of its legs. And arm began to hold the dark portal open, and soon enough, a face could be seen. Four eyes, a large spiked head. Its mouth resembled that of a spider and so did its legs. As the hole began spreading it slowly struggled to come through it, his body was stuck for now, leaving only an arm and its head. As the Neoshadows began to attack everything and everyone in sight, it seemed as though Sayuri didn't care. She was caught in a ...troubling... situation, you could call it. It was either save the people from the Neoshadows or destroy the Reaver and be done with it, and leave the people to fend for themselves. Sayuri didn't know what to do. The last time she had tried to help someone she has gotten punished by Xemnas, and she didn't want it to happen again. Though she couldn't help it.... she felt as though she had to help them... she didn't know how she could feel it since Nobodies aren't supposed to be able to feel anything. She had made her choice to help the people from the Neoshadows, though that choice was short lived. 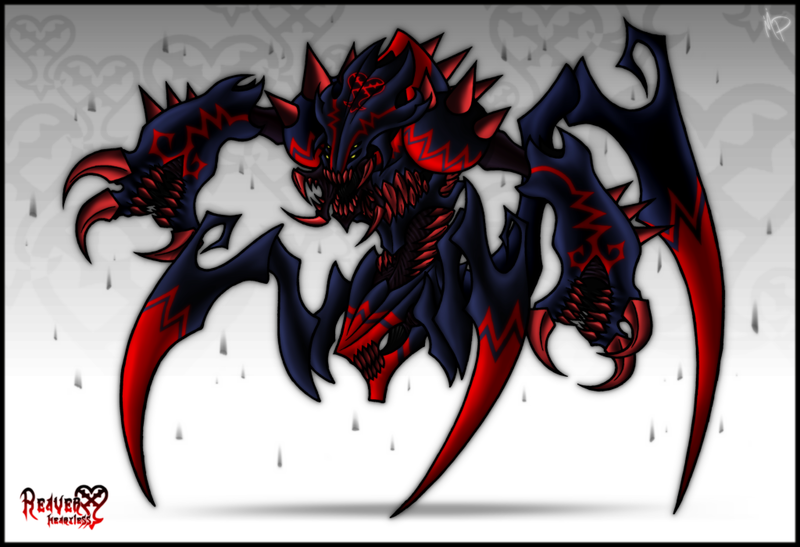 As she was beginning to turn around to face some of the Neoshadows the Reaver revealed itself. This heartless was unlike any Sayuri had faced before, but she had to eliminate it. As a bonus to eliminating it the heart it would release will go to Kingdom Hearts. She held her keyblade in a battle stance and watched as the Heartless struggled to come out of the darkness that shrouded it. Sayuri laughed at how pathetic she thought that was. It seemed to become even more agitated by her laughed, since it busted out of the darkness like it was never stuck. Sayuri's expression quickly changed and with her face still covered by the darkness she seemed more threatening than she was trying to be. The heartless became even more agitated by her appearing challenge. It charged at her not waiting for anything else to happen. Sayuri was ready for it though, from her last battle there she knew what to expect from most of the heartless that inhabit Traverse Town, no matter how unfamiliar. Sayuri jumped out of it's range of attack, jumping over it, hitting it with the keyblade as she did so. She landed on the other side of it,as it collapsed from the hits. But it quickly got back up and charged at her again. Karin watched as the hooded girl hit the giant creature, making it stumble and collapse. This creature wasn’t fully mature yet, so it’s two brains would’ve been working as one. Karin chuckled, the Reaver wasn’t yet at his full potential, it was slightly dim-witted. Letting his emotions take over, he roared again: his many mouths opening at once. He was annoyed but this girl, and he wasn’t planning on losing to someone like her. In his mind, she was puny, but the sense of power that came from her keyblade caused the creature a minor insecurity. He wanted to destroy it. He wanted to feel at the top again, feared by everyone. And as the Neoshadows began spreading from the Third District to the First they began to plague the whole Town. Even more screams of horror and dread would be heard. It was just enough to make up Karin’s chaotic mind. She needed to take action, quick. If only you’d wake up… Her thoughts drifted off as she leapt off the edge of the Gizmo’s shop roof. Reached into her pockets and managed to acquire the two steel rods, placing them together would make her weapon on choice. While doing just that Karin performed a landing roll to smoothen out the impact of hitting the floor; the two rods had become one, which spread out to be even longer than expected killing an unaware Neoshadow that was stalking his pray. She had landed a few meters in front of the Gizmo Shop and, standing up straight, looked at the massive heartless she was up against. This wasn’t going to be an easy task, but what else could she do? The Reaver lifted his mouth-like arms, pointing one at the girl and another at the Mad Hatter’s Suit & Dresses sign. A long tentacle shot out of them, one headed straight at the Nobody, while the other took hold of the sign. Ripping it and throwing it at his opponent. Noticing that the creature had not yet seen her, Karin devised a plan. She began running straight at a heartless, using her rod to strike him on the side of the head. This obviously wasn’t going to do much as more and more Neoshadows appeared out of the dark aura. She was making herself a path up to where the Mad Hatter’s sign had been. Recalling what REM had told her: The only way to defeat it is by taking it apart piece by piece. She smiled as she reached the Hatter’s shop. The Reaver thrashed and moved wildly, the girl was now begging to get him angrier than he already was. Karin, who was holding on for dear life managed to stay on his shoulder long enough for him to calm down. Taking her rod she buried it on his shoulder, making the creature aware of her of her presence. It began slamming itself against the walls of the buildings, making a few of them crumble. Its spider-like legs were moving all over the place killing a few Neoshadows in the process. Reaching into her pocket Karin was able to grab hold of a bomb trap and upon removing the rod that was buried into the Reaver’s shoulder it was obvious that it had caused a hole in it. She placed the bomb inside it and just as she was going to jump off the Reaver one of his tongues grabbed her, throwing Karin against a wall. She struggled to get up. And just as she did, the bomb exploded causing the Reaver’s arm to get blown off. He staggers a bit, changing his attention to Karin, then back at the now exposed girl. The explosion of the bomb in the Reaver's shoulder made a gust of wind that caused Sayuri to close her eyes and hide her face behind her arm. The wind made Sayuri's hair blow back and pushed her back a little. Once the wind was gone Sayuri opened her eyes and saw that the Reaver had thrown the girl off of him. It was even more agitated than she had thought. But she only took that as a way to show Xemnas she was able to handle anything that came her way. She smirked and ran at the hurt heartless. She hit it with her keyblade, although this time with the impact Sayuri felt something else. The dark creature was now even more debilitated as he continued to try and regain his balance, stumbling every here and there thanks to the girls’ attacks. It was holding back, storing its energy. This Reaver, for some unknown reason, was less hostile than the first one Karin had encountered. She became conscious of this odd behavior and, nearly getting crushed by one of its legs, she managed to perform a back flip that saved her life. She stopped briefly, observing it as it continued on attacking the Nobody. Not good… Some sort of light was beginning to materialize in the mouth that was located in the middle part of his body. It was charging the ray that Karin knew all too well: The one that destroyed her home. Traverse Town’s Third District was basically in shambles. The hotel, the shops, everything was destroyed. The people had all ran away and moved to the First District, while others decided to hide in different places. The district had basically cleared out of people, but the screams could still be heard coming from other locations. Was this town meant to be destroyed? And why did this creature appear in such a peaceful night? Snapping out of her thoughts Karin’s eyes were still fixated on him, searching for a way to destroy him. The spider-like heartless growled jumping high up in the air, he towered above the buildings, pointing the mouth on his arm at the girls. The same type of light began to form on it, materializing into a dark orb. He fired these orbs at them, in hopes of being able to hit them. Dodging one, an idea sprung up in Karin’s head. That’s it… She thought turning to the Nobody. The orb she had dodged exploded seconds after impact. “Hey!” Karin half-shouted, she was around ten meters away from the girl. “Can you redirect them at him?” She knew it was possible for a keyblade bearer to do such things, plus, she was Nobody, they had control over darkness which was quite useful in this situation. And as more and more orbs fell, they would either explode or turn into a smaller version of the Reaver. These tiny versions were easier to beat, and with only a strike they’d quickly die out. Sayuri still stared at the Reaver, thinking about what could have caused it to surface in Traverse Town. She snapped out of her thoughts and looked at the girl.Redirect the attacks back at it? she thought after the girl spoke. She looked at her keyblade as if doubting she was strong enough to do that. She looked at the Reaver, who was charging up another attack headed straight for her and the girl. "I... I think I can!" she shouted back at the girl. She held out her keyblade in a defense position just as the Reaver let it's attack out. The blasts hit the keyblade causing Sayuri to be pushed a little, but she managed to deflect them back at it. The orbs hit the Reaver, which caused it to fall onto the ground. A little more hurt the Reaver still managed to get up and tried attacking them again. An almost unnoticeable smirk was spread on Karin’s face as she heard the keyblade bearer send the orbs back at the Reaver. She was busy killing off the rest of the smaller pray, they were annoying little creatures that enjoyed dodging almost every attack she made. They were frustrating. Karin’s smirk faded as the giant monster finally landed on ground, seeing it stand up again was just a pain. Rolling her eyes she turned to face it, the light that was forming inside of it was getting bigger by the second. They had to do something, quick. Or else Traverse Town would be dead in only a few minutes. As it stood up Karin held back, she wanted him to do orb blasts again. If only they were to burst while being created his arm would probably get blown right off. But climbing up his body again would result a problem, so something had to be thrown at it so that they would be activated. She performing a roll to evade a punch that was directed at her and failing to notice the tentacle emerging from that mouth, she was grabbed by it. The Reaver brought her up in the air; the tentacle began to harden its grip on Karin, trying to kill her. While it got on its two front legs the Reaver used its large hind one like a sort of stinger and began attacking the Nobody. Sayuri jumped back trying to get out of the Reaver's range of attack. As she jumped,though, she left herself open for an attack from the heartless. Because of her carelessness the Reaver was able to land a huge attack on her with its stinger. The pressure from the stinger was to much for her to stay in the air. She fell to the ground,face first. Her fall created a large sort of explosion. As Sayuri struggled to get up her eyes seemed blank, almost as if she wasn't there. The wasn't trying to show, that she was trying to keep hidden, had taken over her battered body after she was slammed into the ground. She got up, her anger showing full force, and she ran at the Reaver. She hit it hard, harder than she would have before, trying to get its attention to move from the girl to her.